An aerial shot of the North Pole Station. An international scientific team supported by the National Science Foundation (NSF) will establish a research camp at the North Pole this month. The scientists will use the camp to lay the groundwork for a five-year project to take the pulse of the Arctic Ocean and learn how the world's northernmost sea helps regulate global climate. 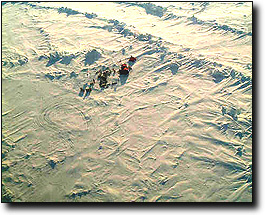 James Morison of the University of Washington, the lead researcher for the North Pole Automated Station project, said the team will deploy a system of floating buoys this season and, eventually, devices anchored to the ocean floor to measure everything from the salinity of the water in the Arctic Ocean to the thickness and temperature layering of its ice cover. "This will be the first time we've put such a congregation of drifting buoys at the North Pole," Morison said. Researchers will return to the Pole repeatedly over several seasons to deploy additional buoys. Michael Ledbetter of NSF's Arctic System Science (ARCSS) program said that after the first year, the number of research projects will expand to cover a broad range of sciences. Morison added that for long-term observations, an automated station does the work of a manned platform, but at far less cost. The new long-term scientific presence at the North Pole recognizes the importance of the Arctic in regulating global climate. Observations have shown that the Arctic Ocean has been affected in recent years by a rapid thinning of sea ice and shifts in ocean circulation. These changes are related to a pattern of change in the atmospheric circulation of the Northern Hemisphere -- known as the Arctic Oscillation -- which is roughly centered at the Pole. The Arctic Ocean circulation and the water flowing from the Arctic into the Greenland Sea affect the deep overturning circulation of the Atlantic Ocean and thus play an important role in regulating climate, said Ledbetter. NSF has committed more than $5 million over five years to support the project Morison's research team will oversee. This year, in addition to the University of Washington team, researchers from Oregon State University, Seattle's Pacific Marine Environmental Laboratory as well as the Japan Marine Science and Technology Center, and Canada's Met-Ocean Corp will participate. Morison said the team will travel to the Pole early in April to begin deploying several drifting buoys to measure such variables as atmospheric pressure, temperature, wind, solar radiation, water temperature, salinity, ice temperature profiles, and ice thickness. Over the next year, the buoys will drift with the ice pack and are expected eventually to drift into the Greenland Sea. He noted that the area around the North Pole is far from any landmass or observing stations. 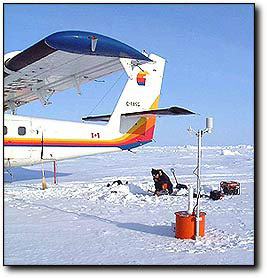 Even with the use of submarines and icebreakers it is difficult to obtain long-term measurements of temperature and other variables at the Pole. The drifting stations are designed to provide a mix of coverage over time and in a wide geographic area. Coverage will be enhanced in future years by instruments that will be moored to the sea floor. In the future, the new U.S. Coast Guard Cutter Healy -- an icebreaker equipped as a science platform -- also is expected to assist in deploying buoys. "This station will really fill a hole in our scientific observations," Morison said. "The station, and others like it, will provide a set of data taken reliably over a long period as a benchmark for the study of climate change." When the North Pole station begins operations, NSF's Office of Polar Programs will have a scientific presence at both Poles. The U.S. Antarctic Program operates three stations year-round in Antarctica, including Amundsen-Scott South Pole Station. For more information: see the North Pole Environmental Observatory home page.